It was a pretty hot day here and it was my turn to host our weekly mothers' group gathering. I wanted to make something healthy and summery without needing to spend time in the kitchen next to a hot oven. 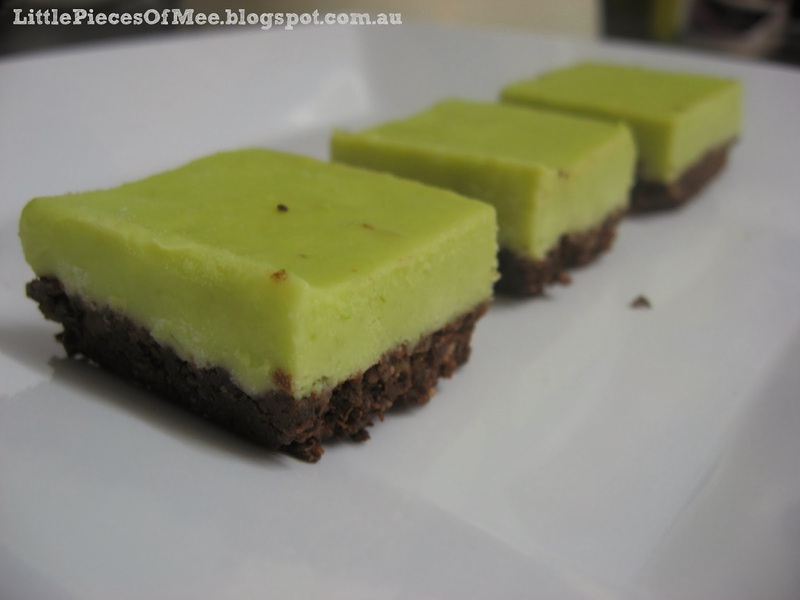 I remembered seeing a recipe in the Woolies magazine a few months ago for a raw lime pie, so I found the recipe and decided to make it in a slice pan instead of a round springform pan. This way I could cut it into smaller pieces so the kids could sample it if they wanted to, and us mums could have one piece or three, without feeling guilty. The end result was pretty good, maybe a bit too strong on the lime flavour (but my limes were on the larger side). I think next time I will cut back a bit on the lime juice and maybe add a bit of extra honey to balance the flavours a bit more. Just a warning though - this is best served within half an hour of removing it from the freezer otherwise it will melt and is very difficult to eat without a spoon. I have the leftovers stored in the freezer for some guilt-free snacks/desserts. This is free from dairy, gluten, egg, and refined sugar, and very easy to put together. You just need about 15 mins prep time and a couple of hours to freeze before serving. Line base of a round 20cm springform tin (or an 18cm x 28 cm slice pan) with baking paper. Process 1 cup walnuts, 1/2 cup fresh pitted dates and 1/2 cup of cocoa in a food processor until crushed. Press mixture firmly into base of the tin and freeze. Meanwhile, process flesh of 2 avocados, juice of 3 limes, zest of 1 lime, 1/4 cup manuka honey and 1/4 cup of organic coconut oil in food processor until smooth. Pour over base and freeze until set. Remove 30 minutes before serving. Cut into wedges and top with frozen berries to serve.